Funeral insurance cover is your easiest and sure way to secure the financial freedom of your loved ones when you move on in life. It's better to have some form of funeral policy than none at all, and Liberty Life funeral cover is one of the oldest and most respected options to choose from. As one of South Africa's leading long-term insurance providers, Liberty, has funeral plans that cater to many different individuals and that fit different financial constraints. Cover for between 4 to as high as 21 members of your family and extended family under one plan. 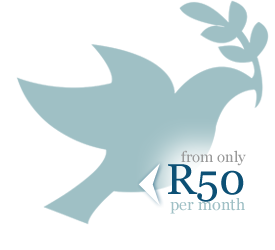 Cover ranges from R10,000 for your parents and/or parents in law, to up to R100,000 for you. Pay premiums for your children under 24 years old and get free cover for 8 of your other children. Double benefit if you or anyone in the policy dies from an accident. Cash back premiums after every 5 years even if you do make claims. Your cover remains up to the time you turn 65 years old, whereby from there you would not be required to pay any premiums, but remain insured under your policy. You can have a 1 month premium holiday, where Liberty would pay bur premium for the month you have slipped. No medical and drugs test.